Reminds me of the grindadráp (literally “grind”), the traditional though perhaps controversial whale hunt in the Faroe Islands. 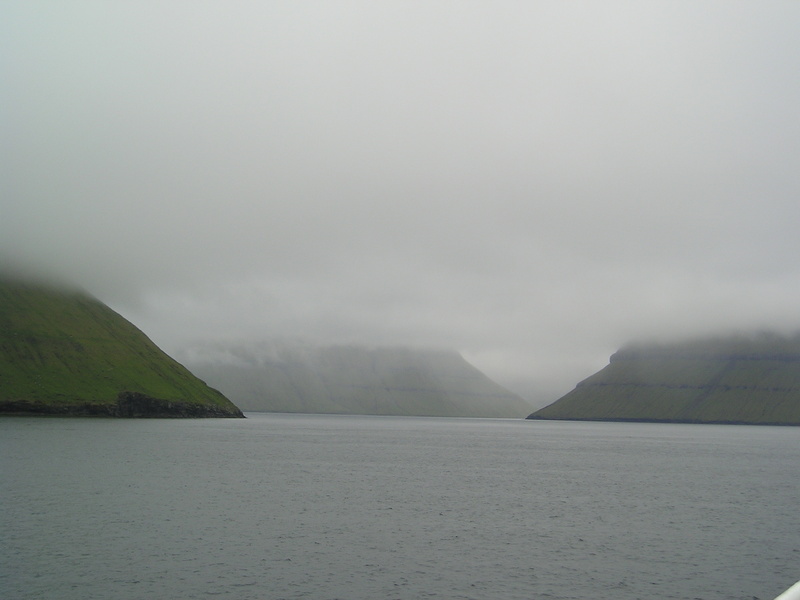 The Faroese go out in boats and try and divert passing pods of whales into shallow fjords. As pilot whales always travel together you snare the whole pod, often thirty or fourty whales, in one go. Once in the fjord the whales are killed using a knife called a grindaknívur. The food from the hunt is distributed among the villagers, and in days gone by it was an essential source of meat for the islanders. These days of course whaling is a far more contentious issue, but I guess as the pod who stranded themselves in Fife (without any human “encouragement”) show, this could be considered Darwinism in action. By the time I’d done this, got back to the campsite and packed up my tent it was already 5pm and time to head off to the ferry, I was catching the Smyril line to Seyðisfjörður in East Iceland that evening. I board the ferry, the Norrona (the same ferry that brought me here from Shetland this time last week) and settle in to the canteen. I’m struck that there are more signs around telling you not to eat your own food than there are menus or useful signs telling you stuff you can do. Today is the longest day of the year, and also marks the half way point of my three week break in the North atlantic. 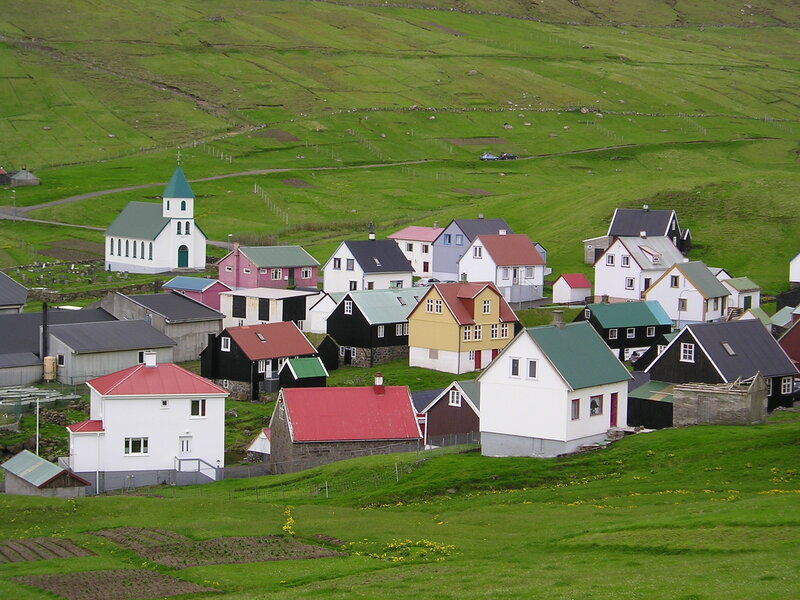 The week I’ve been in the Faroes has flown by, what a place. 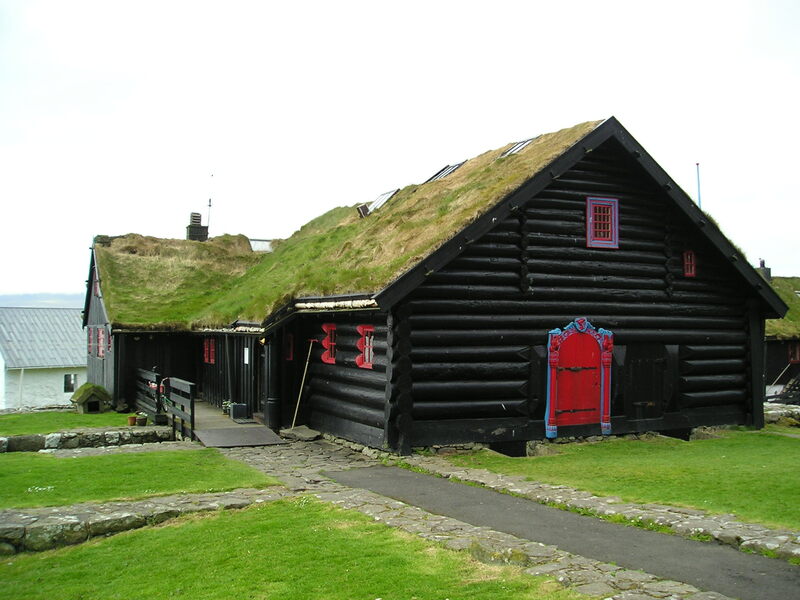 Having given up on making it to Mykines I set today aside to check out the rest of Torshavn. I started in the Føroya Fornminnissavn (historical museum), which had lots of “how we used to live” stuff, an interesting history of the Faroese flag (the old Ram and Oyster catcher flag was replaced by a Nordic cross, designed by Faroese students in Copenhagen. The nordic cross presumably being a prerequisite for any self respecting Nordic nation) They had the old pew ends from the Magnus cathedral which I visited a few days ago. 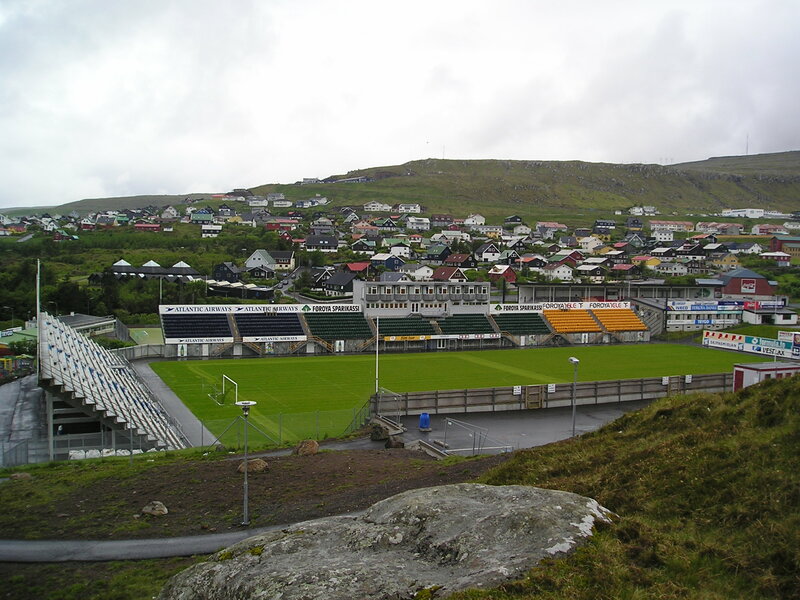 I also checked out the open air museum, there wasn’t much to it but it was interesting enough looking around a house made up in old Faroese style, and I saw the national football stadium. 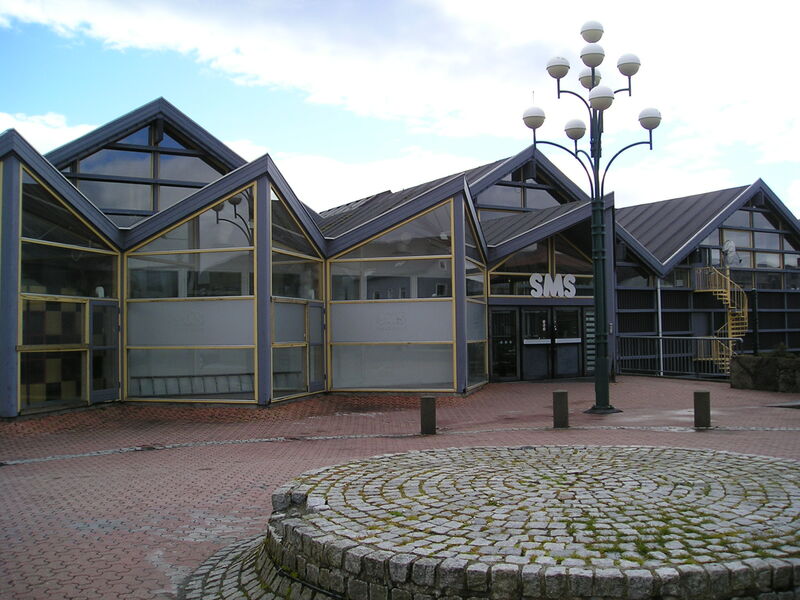 I bought dinner in the supermarket in the SMS shopping centre, and headed back to the campsite where I met a couple from North Wales who were cycling round the islands. I headed into town for a few beers in the evening and met an English guy from Queen’s Park in London. We chatted away until the pub shut at midnight, and left looking for somewhere else to drink. We randomly bumped into some people on the street who were heading to a graduation party on a beach in Southern Torshavn, so we headed down there and sat round a huge bonfire. Music seems to be a big thing in the Faroes and I met a couple of trumpet players who were studying at music colleges in the UK. After several hours round the campsite we all headed to a club, but I fell foul of the “your name’s not in the list so you’re not coming in” rule, seems it was graduates only that night. Still it was 3am and I was just about ready for bed, although it’s remarkable how much easier it is to stay up all night when it never really gets dark. 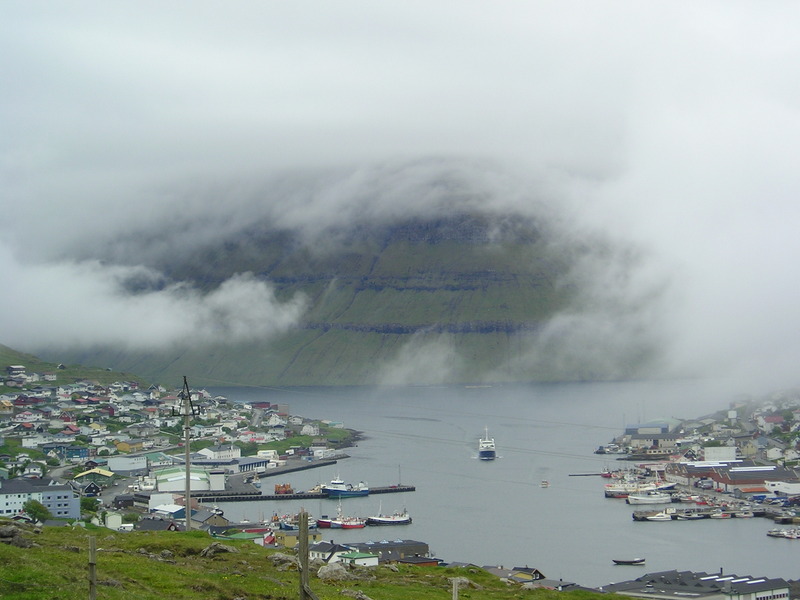 For the second day in a row I slept through my alarm, missing once again I’ve missed the bus and connecting ferry to Mykines. It was blowing an absolute gale last night so I console myself that the ferry crossing (supposedly notoriously choppy) would’ve been a bit of a nightmare anyway. 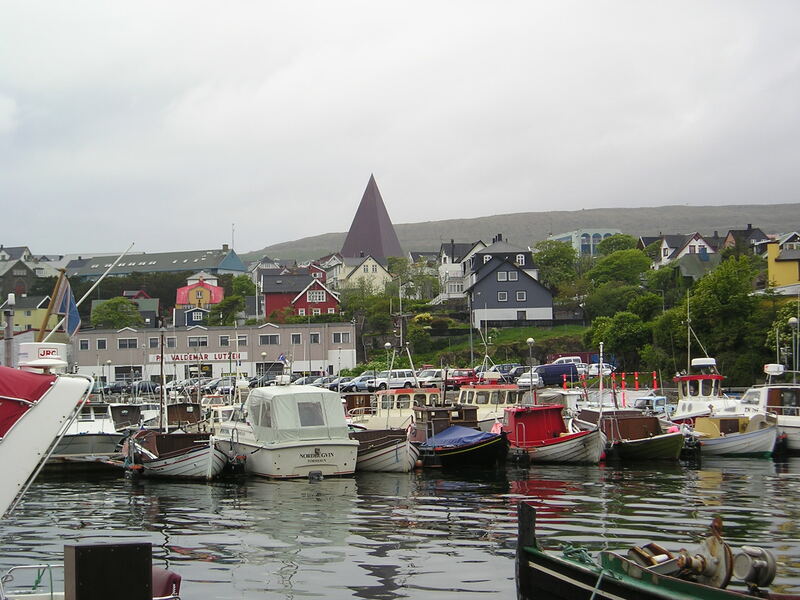 I decided to go to Nolsoy instead, the island immediately East of Torshavn which supposedly makes a good day trip. 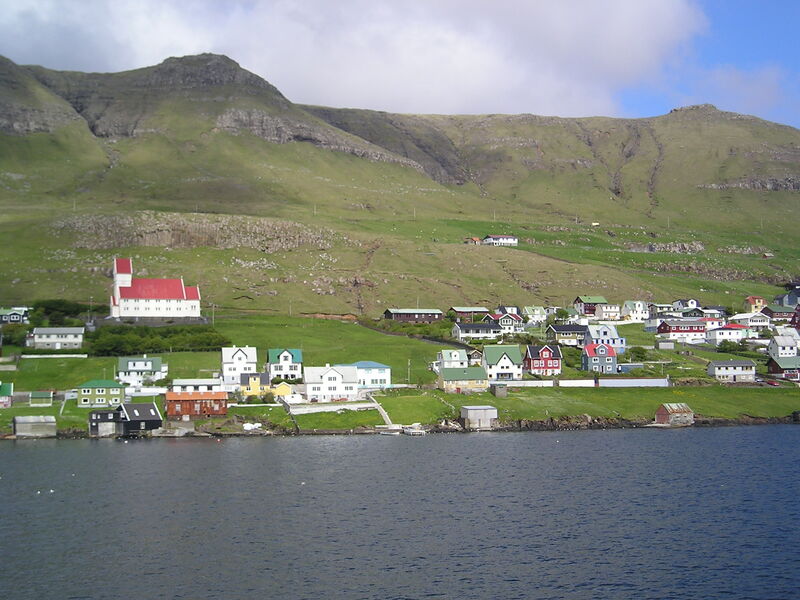 There was noone around at the campsite but a note at reception said the Queen of Denmark was visiting the Faroes today – which would no doubt explain the cannon firing I’d just heard. 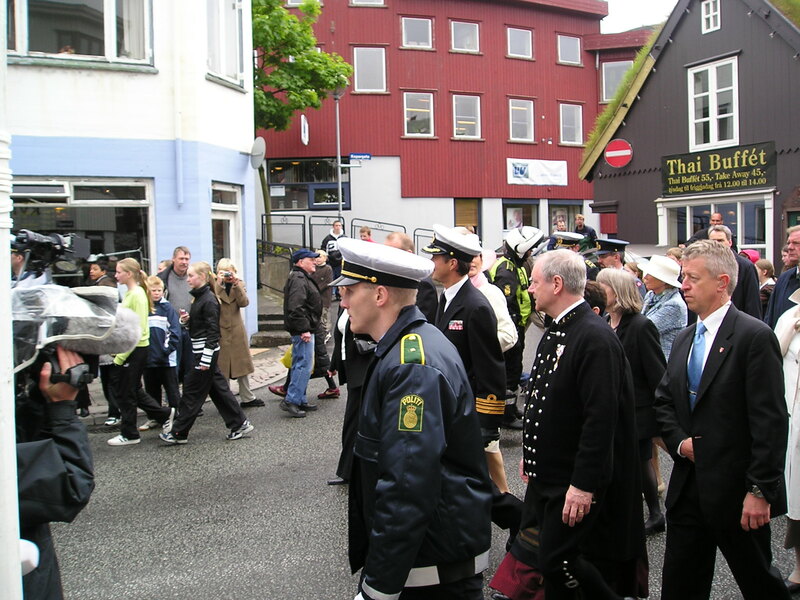 I walked into Torshavn, there were lots of Danish and Faroese flags flying and quite a few Faroese people in national dress. I saw the Queen walk down one of the main shopping streets, it was refreshing how little security there seemed to be. Royal Excitement over I left for the ferry to Nolsoy. The wind was still quite strong at this point, and even though the crossing was just 20 minutes I was very glad to reach dry land. 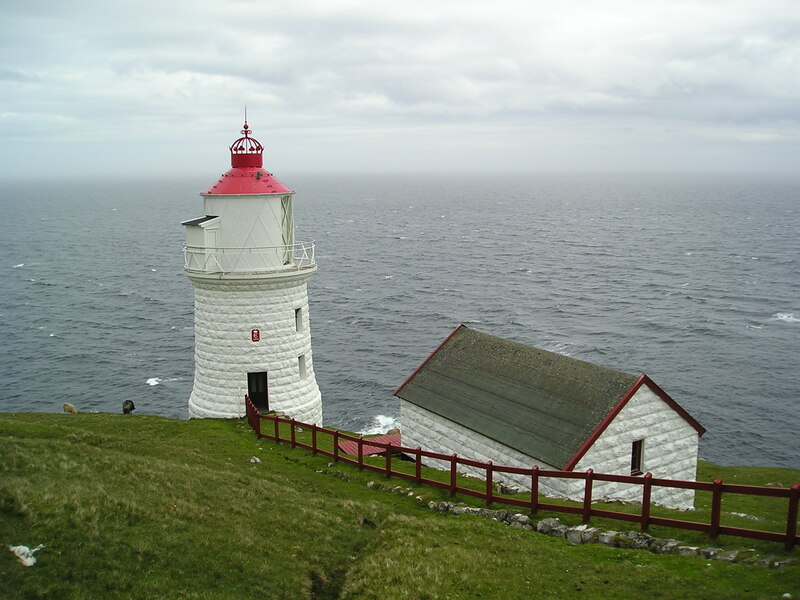 I walked from Nosloy Village to the lighthouse at the southern tip of the island at Borðan, a 6km walk each way. It was an impressive lighthouse, helped by the remote setting. 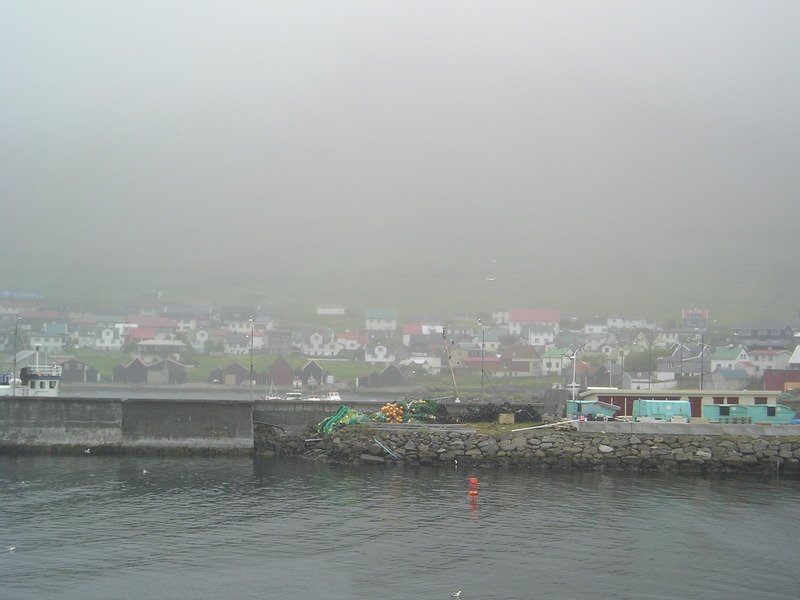 Unfortunately the visibility had dropped and I couldn’t even see as far as Streymoy where I’d just come from. On the walk back to Nolsoy village I stopped to sit down but was immediately set upon by large sea birds swooping down, not sure if they thought I was dead or were trying to attack – but it meant I couldn’t really take a break and had to keep walking. Back in Torshavn I was shattered, had some fast food at a place called City Burger which was pretty horrible, before heading back to the campsite for an early night. There’s something of a “morning after the night before” as I wake up at 11:30, feeling like death warmed up. 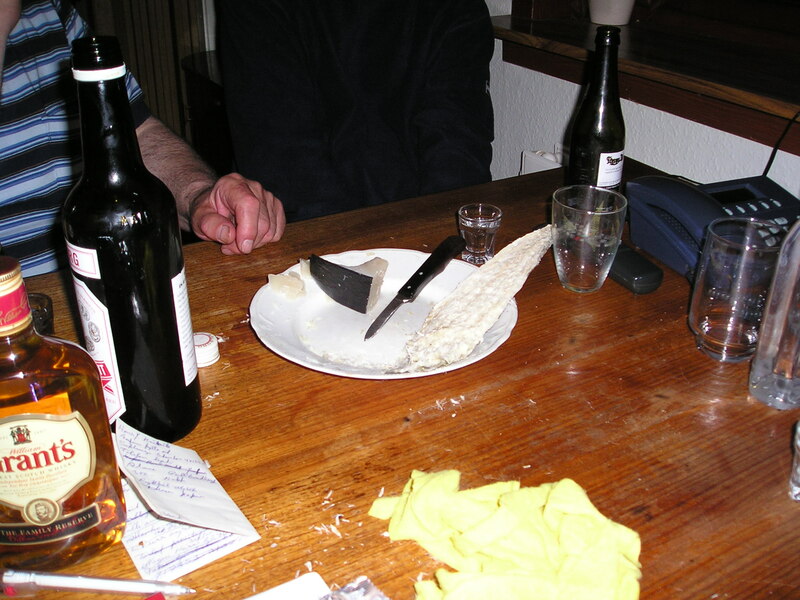 Maybe it was the whale meat I ate last night…or the copious amount of beer I drank I’m not sure. 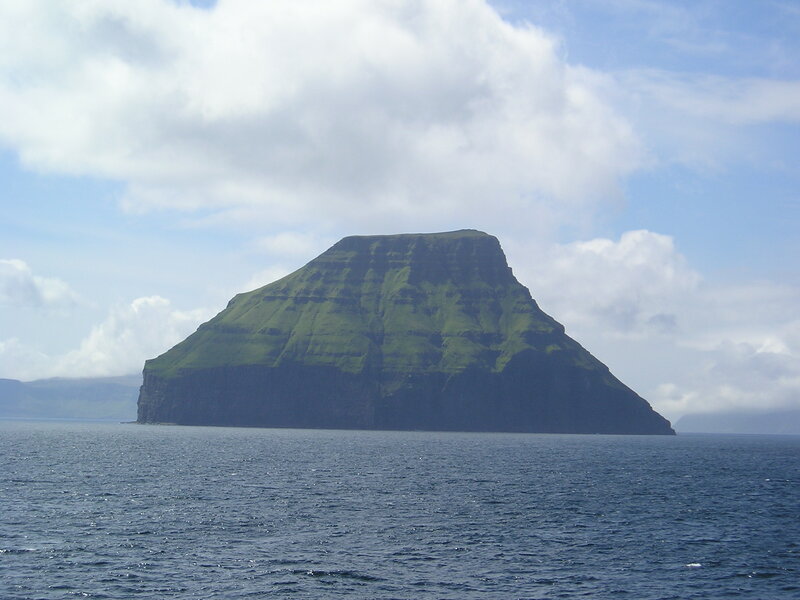 Either way I’ve comfortably missed my 8am ferry, with connections carefully planned to visit Mykines, the remote island in the West of the Faroese archipelago. 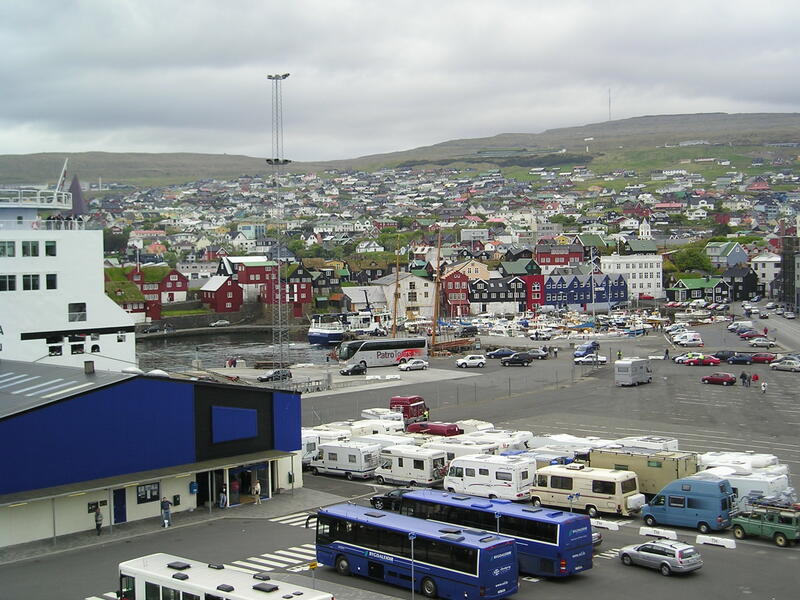 After a bit more cricket commentary and a bit more feeling sorry for myself and my hangover, I look at the ferry timetable and decide to go for the 14:45 back to Eysturoy (and then Torshavn via bus). After packing up my stuff I bumped into Valti again (the Icelandic fisherman I’d met the night before) and he offered me a lift as he was “going for a drive”. 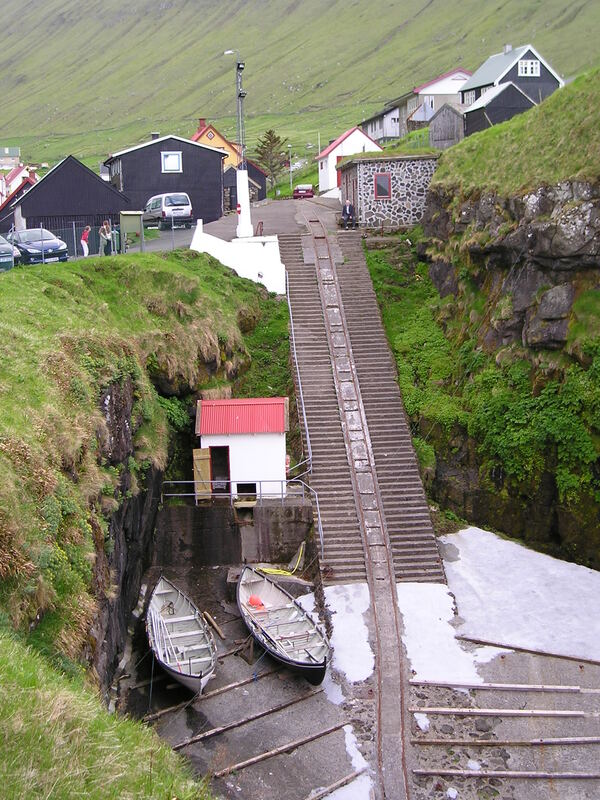 I still felt like death, but given my lack of transport and desire to see as much of the Faroes as I could I took him up on the offer. It was absolutely fantasic, even with my hangover. You see so much more in a car than you could on the bus and ferries. 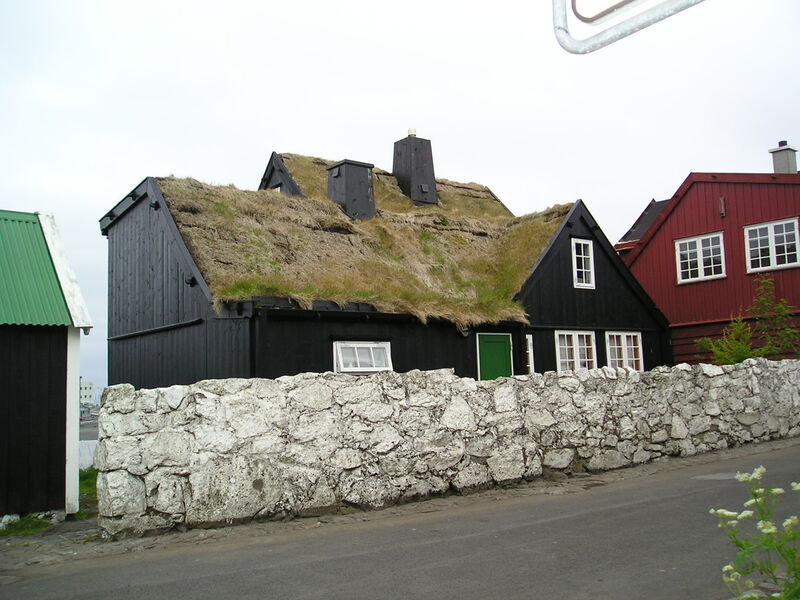 We drove around Northern Eysturoy, which has some incredibly picturesque villages including Eiði and Gjogv, the latter of which I realised I’d seen in various tourist brochures. We went for dinner in Hotel Eiði where we had a decent steak and chips and enjoyed the view down to the harbour. 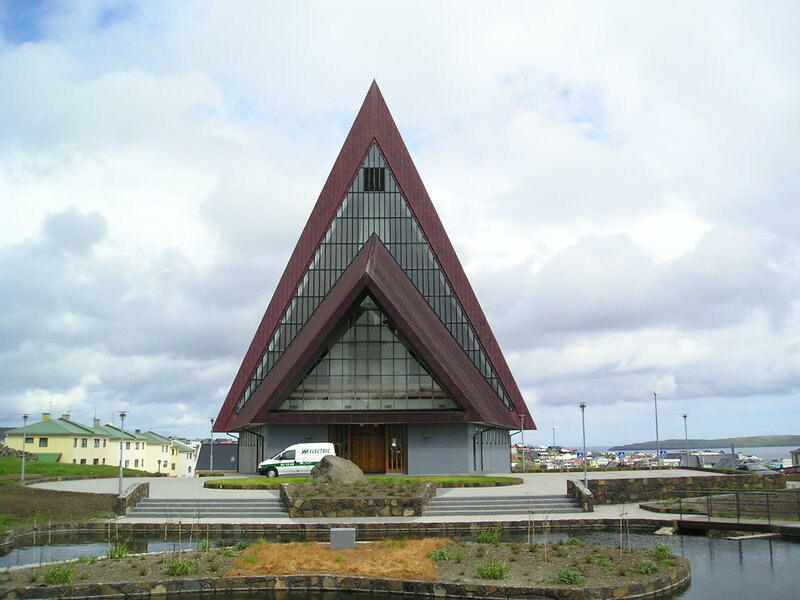 The service was somewhat surly, in stark contrast to the Faroese hospitality I’d enjoyed thus far. 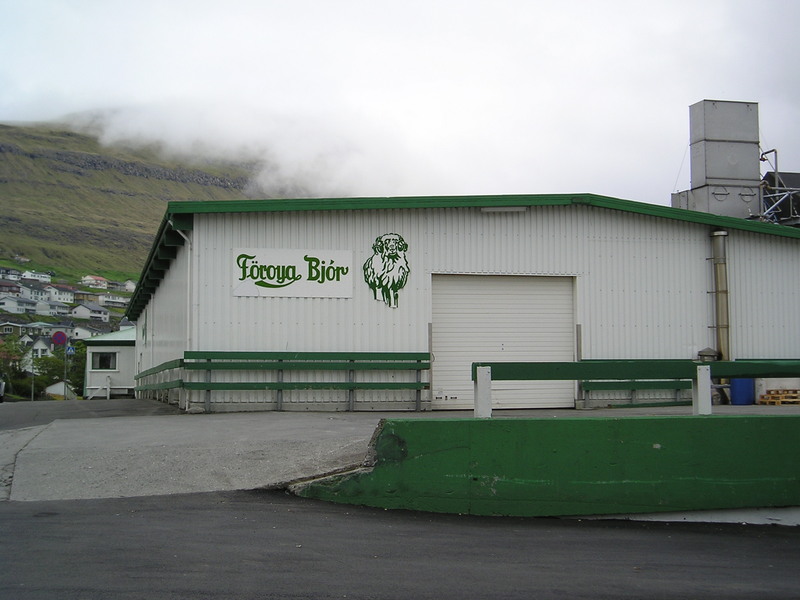 After dinner we drove across to Vagar (an island in the west where the airport is), through the recently opened (as of 2005) Streymoy-Vagar tunnel, paying 170Kr for the privilage which Valti and I agreed was a rip off. Still, I guess these tunnels don’t come cheap. 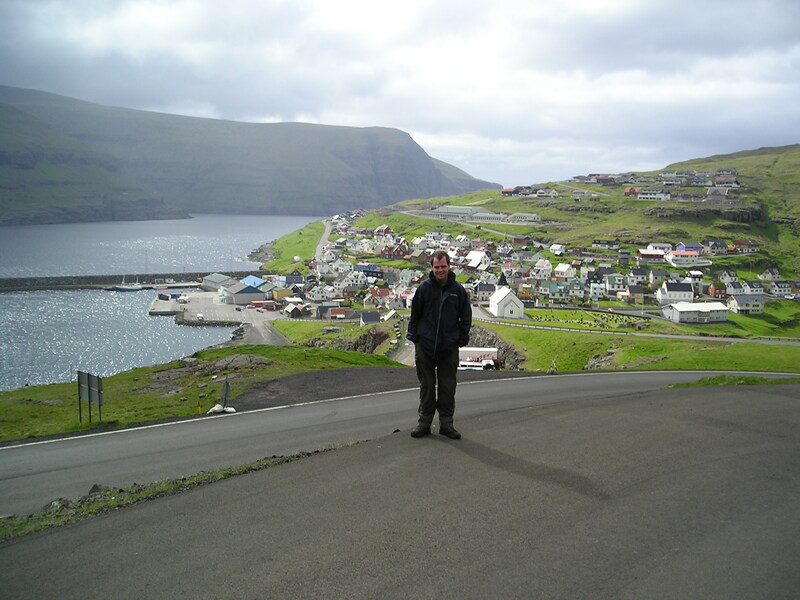 On Vagar we got as far as Bour on the West coast before heading back to Streymoy, where Valti dropped me off at the campsite in Torshavn. By now it was almost midnight (and still light of course), but was windy and rainy and putting my tent up was difficult (my hangover still hadn’t completely surpassed), but finnaly getting into bed was heavenly. I slept like a log through the impending storm. The hours passed. I ate a little, although not having the greatest sea legs in the world I was careful not to overdo it. 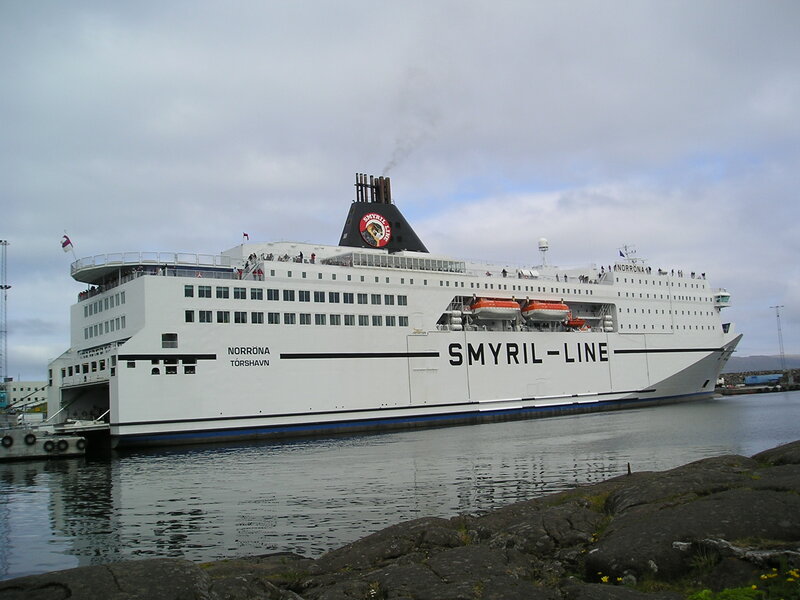 Most of the other passengers on the boat were Faroese, which I guess was no great surprise. 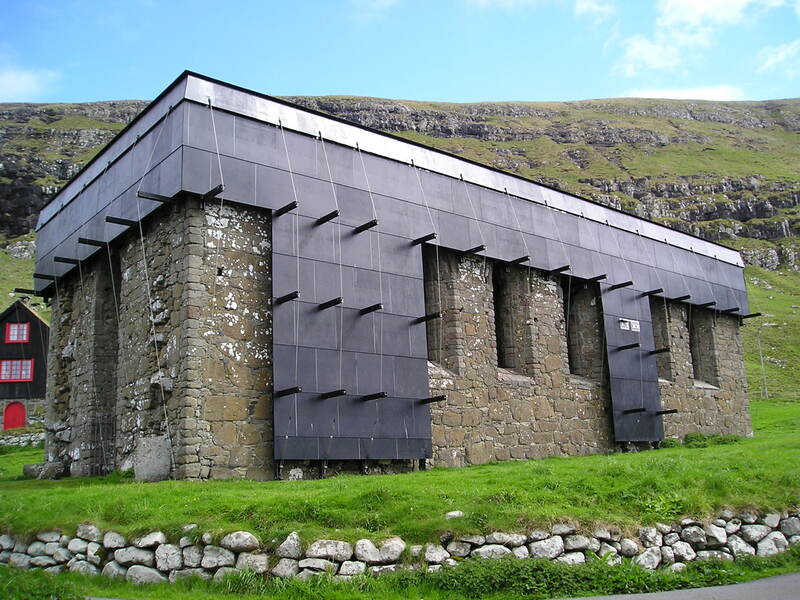 I enjoyed listening to the Faroese language, sounded like a much softer (and less harsh) German, although I should point out I’m certainly no linguist. Finally, after several more hours, the Faroes came into sight on the horizon. They were just like I’d imagined, tiny colourful villages clinging on to the side of sheer mountains coming straight out of the sea. 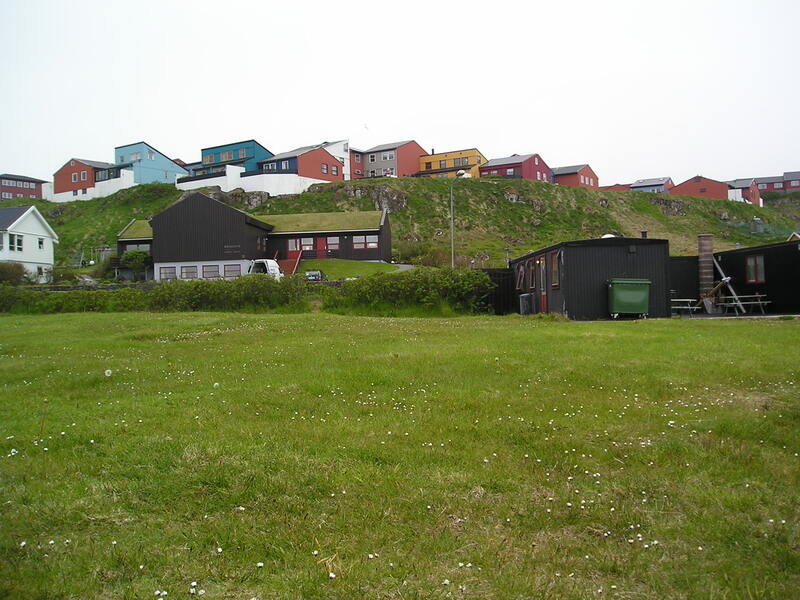 Arriving in Torshavn I made for the campsite, wasn’t too far a walk but carrying all my gear in an unseasonal heat wave (20 degrees!) was hard work. There were two other British couples at the campsite both on bike tours. The campsite was in a nice location slightly out of town right by the sea. Pretty basic facilities but more than adequate for the 5 campers here! There was a friendly local woman running the site. Having set up my tent and relaxing for half an hour, I headed into town. A cramp at the back of my right foot was now getting worse, it had come on during the walk I did on Unst a couple of days ago. Maybe it was my walking boots, but I was planning to do a fair amount of hiking over the next few weeks so it’s a bit concerning. In town I went to Skansin, an old fort, with some great views. 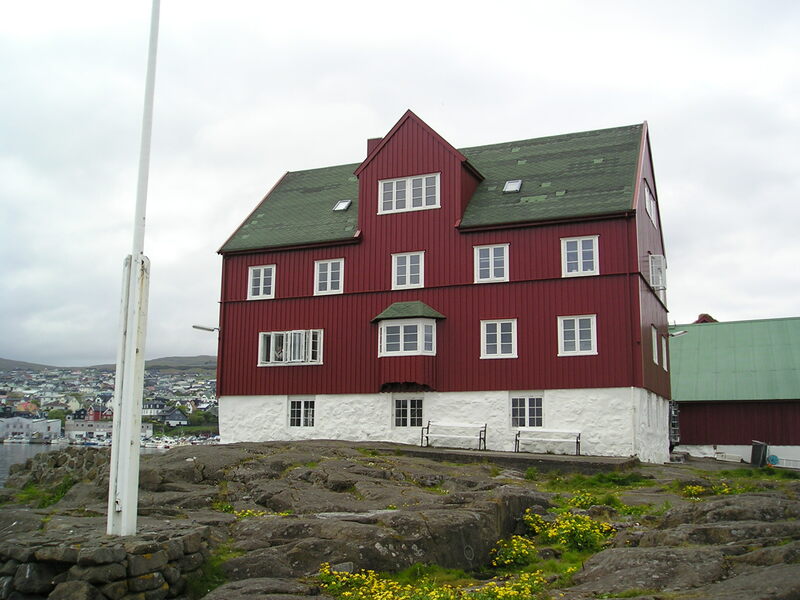 Then took a quick look at Tinganes (the parliament building), which was typically low key. Then I headed to the Tourist Information Centre, and chatted to an Irish guy outside who’d been over here for the football (a European championship qualifier) the week before. He’d been all over the Faroe Islands and seemed to love it. 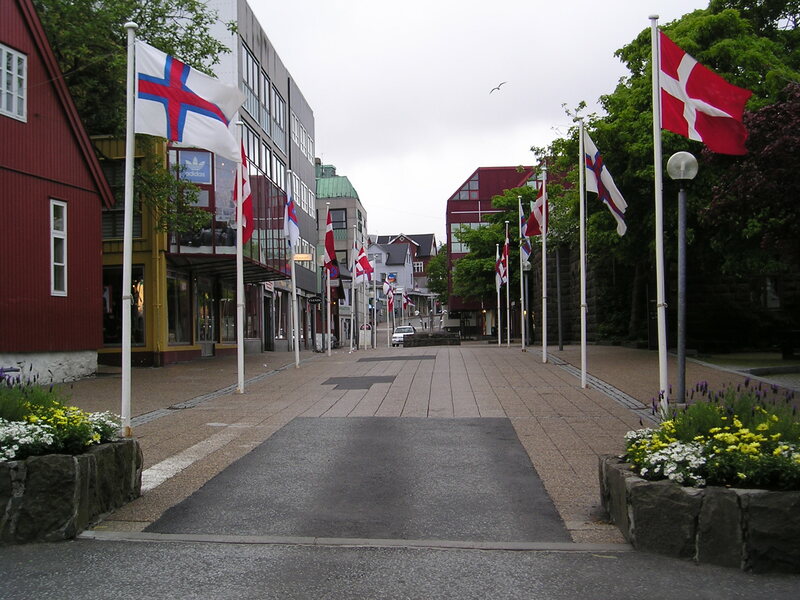 I then went to Niels Finsens Gota, the main shopping street in Torshavn. I’m on quite a tight budget for my trip, and found a pizza place selling takeaway pizza for 70kr but this made me realise it wasn’t going to be a cheap destination, but then that’s Scandinavia for you.